The firm overview page provides a summary of a firm's spending over time, its top clients, issues, lobbyists, agencies and bills lobbied. Clicking on any of the charts or links will bring up a detailed sub-report about that subject. 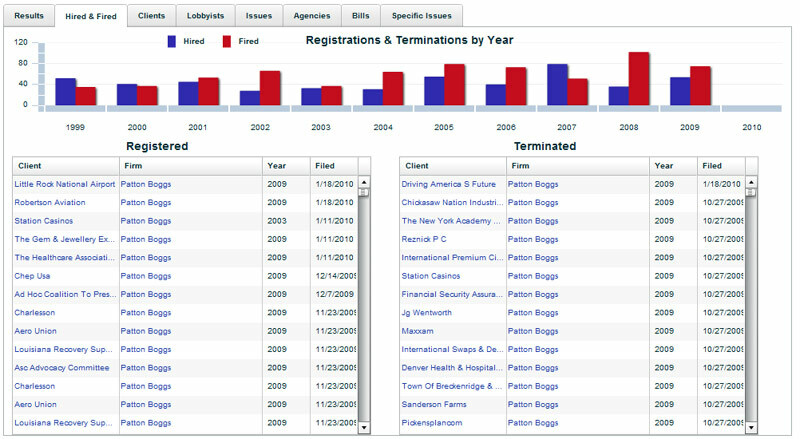 The Hired & Fired tab displays registration and termination information - when a client hired this firm, and when the firm stopped representing the client. The bar chart highlights trends in hiring and firing over time. Clicking on any of the client names will bring up a detailed sub-report about the firm's lobbying with that client. The Clients tab lists the lobbying firm's clients and the amount each client has spent with the firm. You can filter the list to only display clients and their spending amounts for a given year, or clients who have lobbied a particular issue or agency. 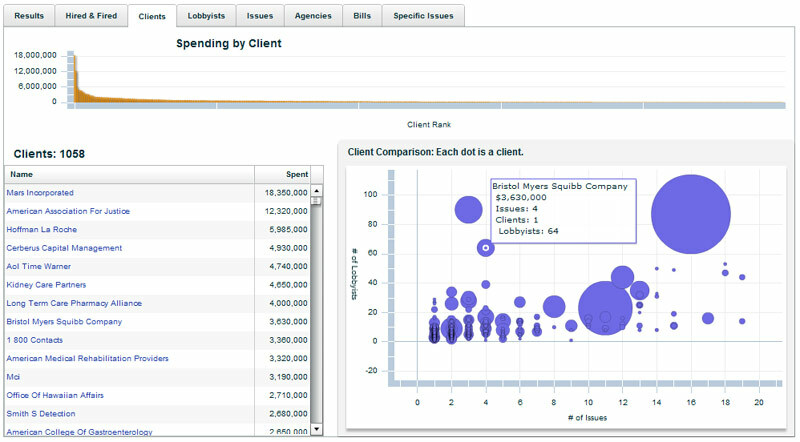 The Y-axis of the bubble chart at the right displays the number of lobbyists this firm has committed to the client. The X-axis displays the number of issues the firm lobbied on the client's behalf. 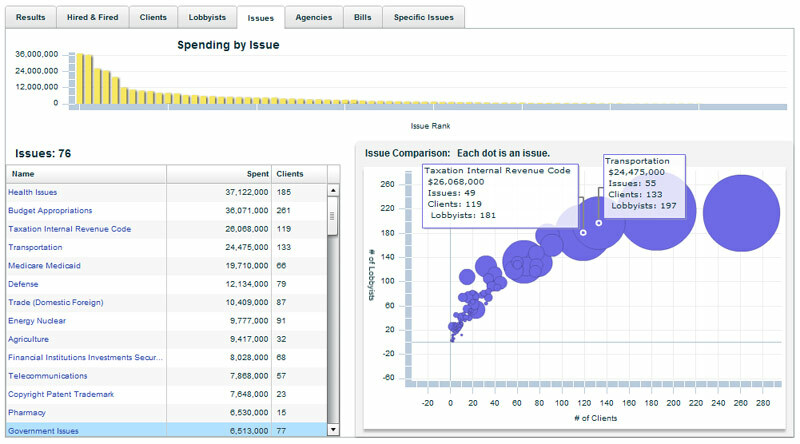 The size of the bubble indicates how much the client has spent with the firm. Clicking on any of the graphs or client names will bring up a detailed sub-report about the firm's lobbying with that client. The Lobbyists tab lists the lobbying firm's lobbyists and the estimated amount each lobbyist has billed clients while at the firm. You can filter the list to only display lobbyists and their spending amounts for a given year, or lobbyists who have lobbied for a particular client, issue or agency. The Y-axis of the bubble chart at the right displays the number of clients each lobbyist has lobbied for. The X-axis displays the number of issues a lobbyist has covered. The size of the bubble estimates how much the lobbyist has spent with the firm. Clicking on any of the graphs or lobbyist names will bring up a detailed sub-report about that lobbyist's activity with the firm. The Issues tab lists the issues the firm has lobbied on and the estimated amount spent lobbying each issue. 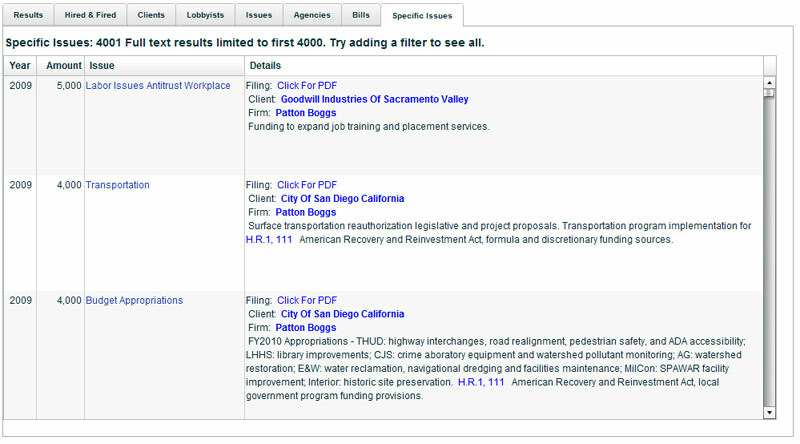 You can filter the list to only display issues lobbied during a given year, issues lobbied by a particular lobbyist, or issues lobbied for a particular client or agency. The Y-axis of the bubble chart displays the number of lobbyists lobbying on that issue. The X-axis displays the number of clients who are lobbying on each issue. The size of the bubble estimates the amount that has been lobbied on each issue by the firm. Clicking on any of the graphs or issue names will bring up a detailed sub-report about the firm's lobbying on that issue. 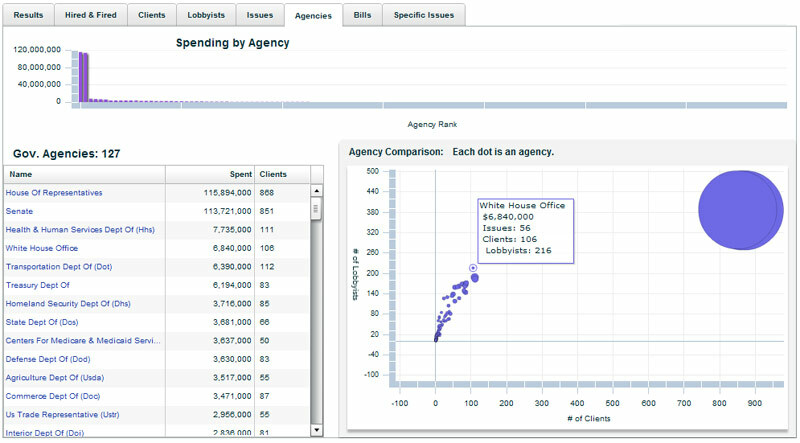 The Agencies tab lists the agencies the firm has lobbied and the estimated amount spent lobbying each agency. You can filter the list to only display agencies lobbied during a given year, agencies lobbied by a particular lobbyist, or agencies lobbied for a particular client. 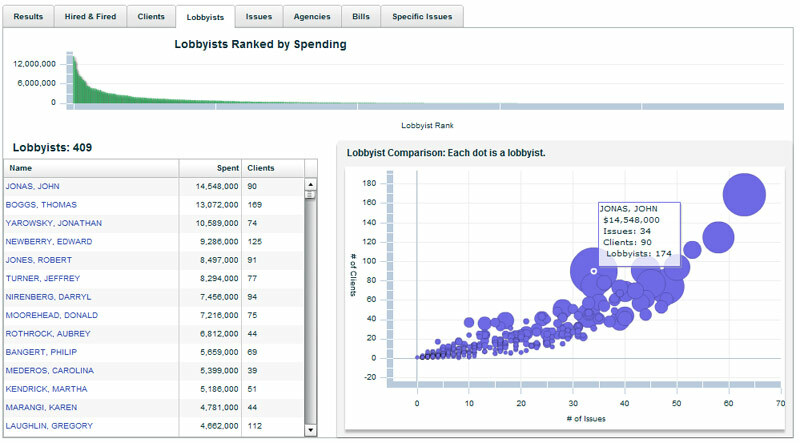 The Y-axis of the bubble chart displays the number of lobbyists lobbying each agency. The X-axis displays the number of this firm's clients who are lobbying each agency. The size of the bubble estimates the amount spent lobbying each agency by the firm. Clicking on any of the graphs or agency names will bring up a detailed sub-report about the firm's lobbying activity at that agency. The Bills tab lists legislation the firm has lobbied and the estimated amount spent. You can filter the list to only display legislation lobbied during a given year, legislation lobbied by a particular lobbyist, or legislation lobbied for a particular client. 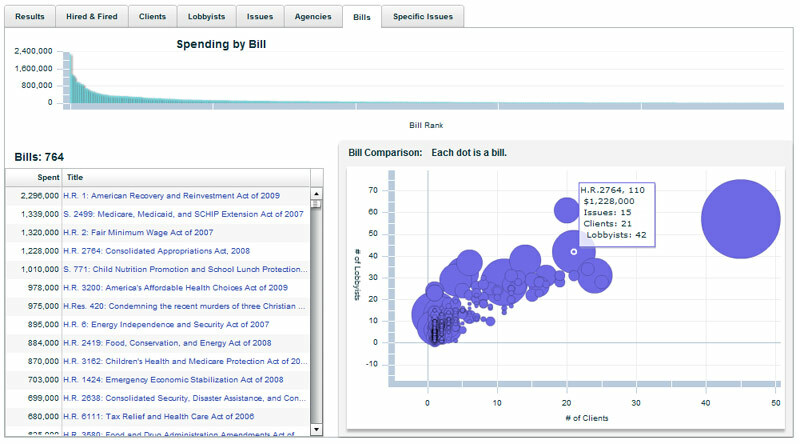 The Y-axis of the bubble chart displays the number of lobbyists lobbying each piece of legislation. The X-axis displays the number of this firm's clients who are lobbying each piece of legislation. The size of the bubble estimates the amount spent lobbying each piece of legislation by the firm. 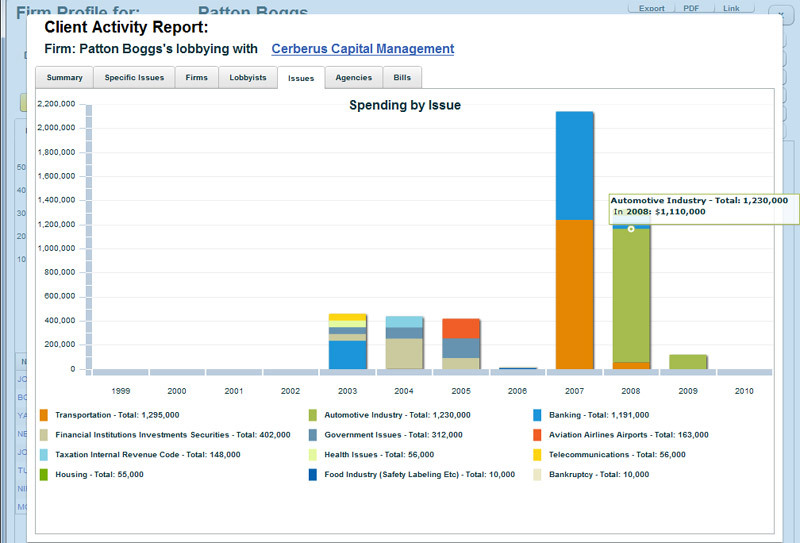 Clicking on any of the graphs or bill names will bring up a detailed sub-report about the firm's lobbying on that bill. 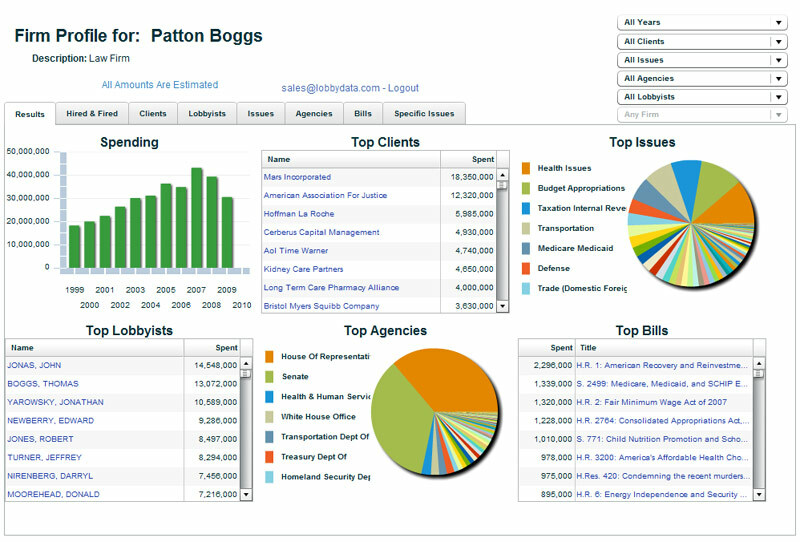 The Specific Issues tab displays the most detailed self-reported data about a firm's lobbying activity for each of its clients. You can filter the list by year, and view all specific issues for a particular client. From this screen you can view the official lobbyist disclosure filings in PDF form. You can click on each chart or link in the main report and it will display a sub-report of that topic. For example: Clicking on a client name will show a report of this firm's lobbying with just this client.